This product was added to our database on Friday 5 April 2019. This product is available for download immediately after confirmation of receipt of payment. By accepting our terms and conditions confirms that the statutory 14 days right of withdrawal for internet purchases by EU residents will not be applicable to this product and the buyer waives his right of recall. Explore the Airport Manchester – the largest British airport outside the London metropolitan region. Thanks to high-resolution ground textures and HDR night lighting, this add-on for XPlane 11 renders a realistic and modern recreation of the airport at every time of day. The textures also feature physically correct lighting and reflection effects. 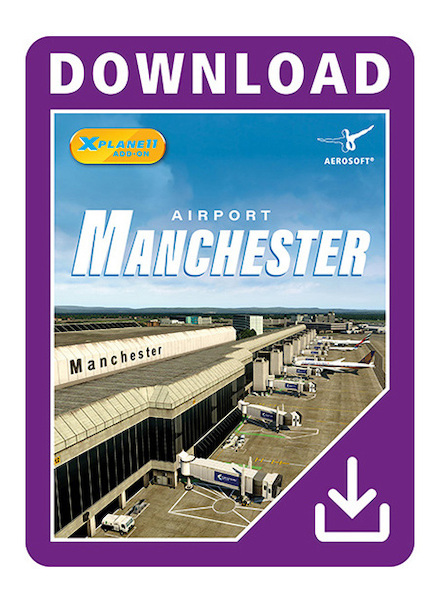 Animated service vehicles, marshallers, and jetways bring the virtual Airport Manchester to life. In addition, users of TerraMaxx can enjoy seasonal textures that paint the scenery white during winter. The add-on is also compatible with Orbx TrueEarth as well as World Traffic 3.